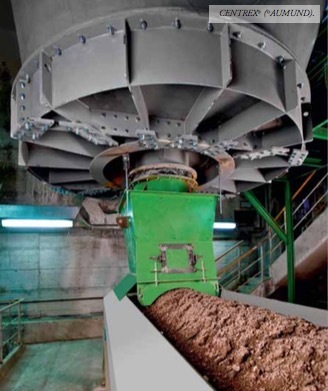 Arabian Cement Co. (ACC) is building a new Brownfield-cement mill in Rabigh (Saudi Arabia) with a clinker production capacity of 10,000 tonnes per day. AUMUND Fo¨rdertechnik GmbH has now received the order for a substantial package of machines for the grinding plant currently being constructed in Rabigh. Initially it will grind externally produced clinker. Ten years ago, AUMUND won a contract to supply equipment for lines nos. 5/6. AUMUND will deliver 16 bucket elevators, seven deep-drawn pan conveyors, four arched plate conveyors and two CENTREX®-Machines by 16 July this year. Depending on their field of operation, the 16 bucket elevators are equipped with belt or chain and have elevating heights between 22 and 73 metres. They will be utilized for the transport of cement from the grinders to the cement hoppers, for the clinker transport, for the charging of the grinders and for the grinder circulation. One of the bucket elevators will be used for charging the grinders with additives (pozzolana, limestone and gypsum). The conveying capacity of the individual machine is between 120 and 660 tonnes per day. Five of the seven deep-drawn pan conveyors (axis-centre distance: 50–148 metres, conveying capacity: up to 800 tonnes per day) will be equipped with baffles. The deep-drawn pan conveyor with baffles (KZB-Q type) has been constructed for inclination angles up to 45° and axis- centre distances up to 78 metres. Baffles bolted to the pans and stabilized by catches pressed into the side panels, provide for flexibility and an efficient, reliable transport during conveying up the inclination. With the pan conveyor, conveying capacities between 33 and 1,300 cubic metres per hour and pan widths between 400 and 2,400 millimeters can be realized. The conveyor utilized at ACC Rabigh has a pan width of 1,800 millimeters and will be used for transporting clinker to the clinker hoppers. Since the customer wants to do completely without the use of spillage conveyors, AUMUND developed special discharge chutes with spillways during lay-outing the plant. Besides, special spatial demands had to be considered. Since the optional transfer of the material to two different conveyors should be a possibility, the chutes were designed to serve a deep drawn pan conveyor on both sides respectively. Four arched belt conveyors with a pan width of up to 2.40 metres are utilized for the transport of clinker, gypsum, additives and pozzolana. The highest performance machine for the transport of clinker has been designed for a capacity of 1,200 tonnes per hour. The package of delivery is completed by two machines of the CENTREX® type with a diameter of five metres for the discharge of FGD gypsum.